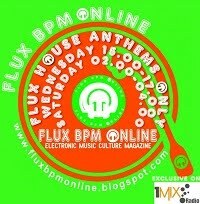 Flux BPM Online proudly announces the 3rd episode of the radio event /show on 1mix radio Trance Anthology. 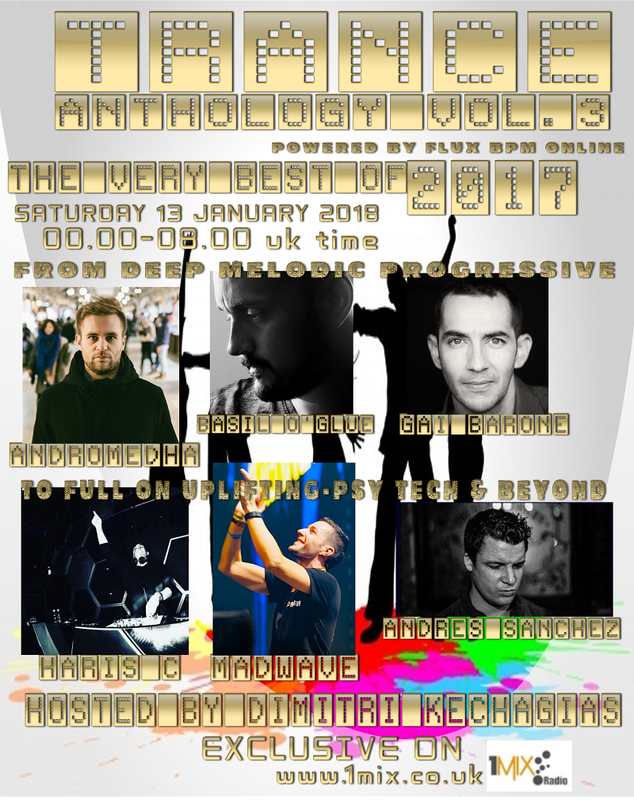 Trance Anthology Vol.3 has the theme of Best of 2017 as we wish to celebrate the fantastic year 2017 in trance music. For that reason we have prepared on 1mix radio an 8 hours extravaganza radio show with the very best of 2017 mixed and compiled by very special guests and your host Dimitri. The line up will take us on a journey from deep melodic progressive trance with Andromedha from Poland who has great releases on labels like Silk & Pure Progressive. Then the magic hypnotic progressive sounds of Basil O'Glue from Greece who has released his very first album in 2017 Depth of Field on his own label Saturate Audio and he is regular DJ at the Luminosity Beach Festival and he has performances in wide variety of clubs worldwide. Third progressive journey comes courtesy of the Italian progressive mastermind Gai Barone who has performed in the biggest club events as part of the Pure Trance events and of course in top festivals and he will appear in the Progressive stage at ASOT 17th February 2018 in Utrecht. The show then will move on the uplifting/euphoric trance / psy tech trance side and we have invited the uplifting/psy trance DJ & producer Haris C from Cyprus who celebrates the release of his album My Life on Alter Ego Records with firecracking guest mix that includes tracks from his album & his favourites from 2017. Next stop is the country that adores hard uplifting trance vibes Switzerland with the main trance force Madwave who is well known for his legendary label Phoenix and releases on many labels including Aly & Fila's FSOE. Finally Andres Sanchez from London has the mission to uplift you to the maximum and blow your socks off. With releases on top labels including ASOT, FSOE, Grotesque and more Andres is future trance force for sure. For the final set of the show your host Dimitri Kechagias will pick some of his very best tracks from 2017! We are waiting to welcome you on 1mix radio. 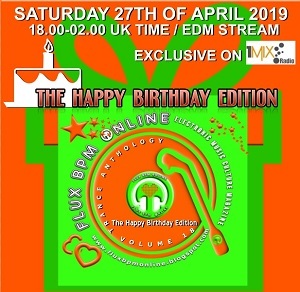 Its big pleasure to have you as our listeners and we can not thank enough Paul at 1mix radio for allowing us to organise this show and deliver this top line up for you!